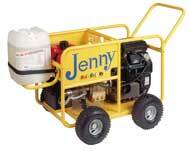 Pressure Washers are designed to save time and money, so it’s very important that you choose the right model. Over-sized models waste cleaning power…undersized models waste time. By combining pressure, volume, heat and chemicals pressure washers can clean so much faster than manual methods (sometimes making the cleaning job go six times faster) that the labor savings alone can pay for the machine. Available in six models: ELHW 1021, ELHW 1030, ELHW 1421, ELHW 1530, ELHW 2036, ELHW 2042. Call 1-800-677-8685 for which model and options are best for your shop. Hot pressure washers are best suited for cleaning large areas quickly and where the type of cleaning is typically light to medium oil, gum, grease, and grime. The heated water aids in the loosening of the dirt, and when soap is added, the dirt will come free of the surface. These machines will clean heavy grease deposits and grime, but will leave a slight grease or oil residue. A good application would be a tractor-trailer. There are large areas that need to be cleaned, but the dirt is not caked on or very thick. Available in ten models: HPJ1020, HPJ1420, HPJ1530, HPJ2040, HPJ2536, HPJ2542, HPJ2545, HPJ3040, HPJ3050, HPJ3540. Call 1-800-677-8685 for which model and options are best for your shop. 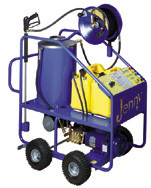 Put the power of a Hypressure Jenny to work washing equipment and vehicles, concrete floors and sidewalks, and general maintenance and housekeeping tasks of any facility. The HPJ’s will allow you to clean with no wasted time, effort or water. Exact cleaning needs can be met by combining a range of pressures from 1000 to an amazing 3500 psi and flows from 2.0 gpm to 5.0 gpm. The heavy duty powder coated roll cage frame was designed to be compact, portable and able to withstand years of rugged and punishing use. Cold pressure washers are at their best when used on earth dirt, road dirt, mud, etc… generally where grease and oil are not a factor. With the help of a soap you will be able to wash construction vehicles, clean sidewalks, parking lots, swimming pools, and cleaning jobs of this type and nature. Cold pressure washers are not the ideal choice for washing grease or grime (Grime is when you have dirt that is clinging to or ingrained in a surface). The washer may move the grease and grime around but it will not clean the surface as it should, without the use of a very aggressive cleaning chemical. Cleaning a fifth wheel on a tractor-trailer would be a good example, the heavy grease is more likely to splatter and smear than to come clean.